Ekomini, a leading developer of interactive learning solutions for children, said it has signed an agreement with Digital Middle East, a Bahrain-based technology company, to promote digital financial literacy in Bahrain and the GCC region, through interactive online platforms and innovative mobile applications. The project will provide educational tools and web-based applications to help kids, teens and families improve their financial skills with a fun and entertaining approach. 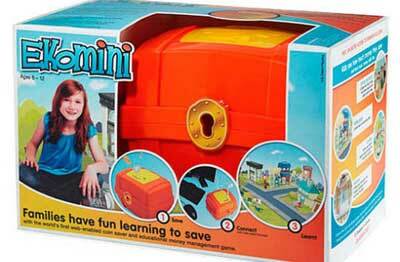 The products include an intelligent money box equipped with a coin reader that counts, retains in memory, and uploads the count to an Ekominiville educational platform directed to kids, a curriculum for schools, an allowance and budget applications for teens, as well as a family saving social game (Ekodream) for families with mobile applications. It will also offer governments around the region, a great opportunity to introduce the platform, tools, and apps in their educational programs. It introduces children to the concepts of budgeting, saving, and banking terms. The Bahrain Economic Development (EDB) played a key role in the development of this partnership, as part of its efforts to support businesses looking to access the Bahraini and wider GCC market. "Financial literacy is vital for encouraging people to take more control of their lives and future. We, at the EDB, recognise the important role that each individual plays in growing our economy, and we confidently believe that this partnership between Ekomini and Digital Middle East will be able to promote responsible financial management to the youth in our region," remarked Vivian Jamal, the executive director (Business Development) Bahrain EDB. Ekomini founder and CEO Philippe Racine pointed out that there was a critical need for financial education in the region. "Over 80 per cent of parents believe that personal finance education is vital, because they believe they would be in a healthier financial situation now if they had been taught about money matters at school. We aim, with this project,at helping parents and teachers begin the crucial conversation about wise money management with kids in an easy and entertaining way," he stated. "We are very delighted to sign this agreement with Digital Middle East, and we are very optimistic that it will enhance personal finance management education in Bahrain and across the GCC countries," remarked Racine. Digital Middle East managing director Abbas Hussain said the demand for financial education was on the rise across the GCC region, as many young people in the region were struggling to manage their debt and make the right financial decisions. "We have a vision of introducing technology in every aspect of life and our goal with this agreement is to educate young people on best practice financial management through our latest technologies," he noted. Bahrain’s progress in the ICT industry is demonstrated by the 2012 UN eGovernment Readiness Survey, placing the Kingdom 2nd in the Mena region. The survey placed Bahrain 36th of 192 countries worldwide in its application of ICT to provide access and inclusion for its citizens.